Dave Sigaty: I think that I am much like Arno. I mainly study ("check" is more accurate :-) in reaction to something that happens over the board either to me or in a game that I watch. It is very seldom that I study something in a forward-looking way where I look at a new joseki with the intention to try it out in my own games. I don't find that attempts at intensive individual study help me that much. I quickly become bored and start to play around with the variations. This is wasted time in terms of advancing my skills regardless of how enjoyable it is at the time. Instead I find that presenting issues to an audience (both by contributing to SL and by writing reviews for the Go Teaching Ladder) adds some additional discipline that lets me dig more deeply. However, regarding Joseki in particular, there is one thing that I did that I think helped a lot to get a sense of Joseki as a whole. I was just getting started in Go (mid-kyu player in the U. S.) when Ishida's Joseki Dictionary was published in 1977. I remember waiting impatiently for volumes 2 and 3 to be published. I read each one like a book - without trying to analyze each line. I would recommend this to anyone. Most of all you should play what makes sense to you as situations arise in your games. Then, as often as possible, think about the results. After that check a dictionary if you have one available (and since there are some on-line now everyone has something available :-). RobertJasiek: The Ishida teaches only by examples. So it misses what is possible: A general theory for recognising and justifying an even exchange and a general explanation of every tewari method. I believe that it is helpful to look in the joseki dictionary to know what is considered a good sequence of moves. But the true understanding comes when you play this particular joseki and play it a lot. A pattern by itself is not that good as the understanding of what kind of possibilities it carries, how big are continuations, what changes in the surrounding situation would require a reinforcement of the position, and so on. Thus a study of a joseki, even the simplest one, is a long process. The book gives you a simple idea only. To weaker players such moves do not come to mind at a glance. But we can appreciate the idea when looking through the joseki dictionary. dnerra: I think the question in the title of this page should rather be: "How do you learn by studying josekis?" I agree with most of what has been said above, but I would go a bit further than Dave and deft: I think you should study joseki the same way that you study professional games: Try to guess the next move, be VERY surprised about the moves you did not expect, try to understand why you did not expect them etc. Since joseki moves are more "universally true", I claim there is one thing you can learn from josekis better than from anything else: good shape. RobertJasiek: I would recommend a combination of books providing joseki understanding and strategic concepts, especially my books (because they provide the most detailed general understanding) (2, 3, possibly also 1 if you do know yet which approach moves, pincers and extensions are correct), but also other books on some strategic concepts (the more books the better): Attack and Defense, Strategic Concepts of Go. 1. Don't think that all you have to do is learn the moves. That is not studying the joseki. RobertJasiek: The advice is right but here is more: Some Thoughts About Studying Joseki. JamesA: I quite like the 3 Get Strong at Go books on joseki. They are a good way to learn what to do if someone doesn't play the joseki, and therefore why the joseki are joseki! Also, it is good reading practice at the same time. Selecting sequnces from various books, I have created a 'small' (100K) sgf file of all the standard corner sequences I think I should know. Cross - Trick move or mistake. Circle - Special circumstances only. For example, a violent move that can only be used when there is a lot of help around. Square - Continuation, or potential. Approximately - e.g. for an extension whose placement can vary. One of many - e.g. from here on, the sequence shown is just one out of many that are possible. Interchangeable - e.g. 2 moves marked as such indicate that their order of play can be swapped. Sounds useful, but in practise there could be sequences that are swappable. So maybe I'll need 2 symbols, one for 'beginning of interchangeable sequence' and one for 'end of...' Also have to indicate which sequences are paired. Anyway, I am attempting to learn the sequences using the CGoban2 sgf editor. After 'marking variations' I go through the file (well a 10K section of it) and any branches I get absolutely correct, I cut. If I make a mistake I have to go up the tree to a new branch. After one pass through the file, I save it, then repeat the process on this file an hour or so later. Repeat until file is empty. When I can empty the file in one pass, I'll try the same procedure without marking variations. BobMcGuigan: I'd recommend the two volumes of Whole Board Thinking in Joseki by Yang Yilun. Knowing what issues dictate the choice of a joseki is about as important as knowing the moves of the joseki itself. Otherwise you might happily play all the moves correctly and end up with a terrible result from a whole-board perspective. RobertJasiek: More important than books with examples of strategic choices mostly early during the game are books with general advice for and examples of strategic choices during different phases of the game. HolIgor: There are four corners and four sides and at different stages of the game the choice of joseki is different. There is a first corner joseki which is played on the almost empty board, so you choose with regards to the type of game you want to play. 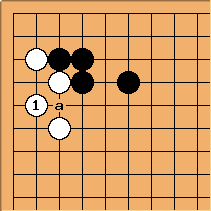 Then the second and the third corners are played taking into account the first corner joseki, direction of stones etc. And the fourth corner rarely is a joseki. It is whatever your reading of the game tells you. For example, I like to play for territory in the first corner and influence in the second and the third and the rest is just a fight. BramGo: Creating BruGo was the fastest way for me to learn joseki. And I am still learning new variations every day. Creating your own dictionary certainly is the most structured way to study joseki. RobertJasiek: From experience, I agree that media creation is the most structured way of studying joseki; however, much general theory must accompany the dictionary. But not everybody has the time to create his own dictionary. For those with less time, it is good to read such joseki books (links see further above) that provide access to joseki understanding and reasoning in great detail. HughJFan: This year I've been mainly studying Joseki. In my opinion, the DailyJoseki website really changes/helps learning Joseki. My 'method' has been to play through a set of Joseki on that web page repeatedly, every day. I keep repeating this until I start to remember them, especially the vital points (then I keep repeating them until I'm sick of them!). At the same time I read the theory about them moving from simple sources to more definitive sources, for example the entry (if there is one) in 38 basic joseki, then a mid-range book then Ishida (I don't have the new edition yet). I say mid-range one rather than Essential Joseki because whilst I have that and I do like to see what it has to say I much prefer the The Nihon Ki-in Handbook Series books even game joseki and star point joseki. Combining DailyJoseki with book study is perfect for me as the books make the sequences easier to remember and learning the sequences with DailyJoseki makes the texts easier to follow.